RBTH has picked 6 natural wonders, which you should see while visiting the Ural region. 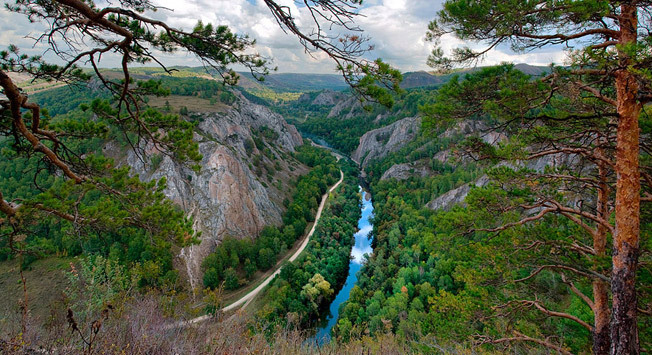 The Muradymovskoe Gorge is a natural park in the Republic of Bashkortostan, where there are approximately 46 caves with various morphology, sediments, hydrology, microclimate and wildlife which are all located in the beautiful valley of the Bolshoi Eek lake. In the places where the river so-to-say "saws" the Devonian limestone, steep, almost vertical cliffs are formed, which sometimes go as high as up to 100 meters or even more. The most famous and favorite tourist spot is the Pigeon grotto, where cave pigeons and bats live. Besides this, ancient people, animal bones and tools of the Mesolithic age exceeding 15,000 years were also discovered in the grotto. To the western shore of one of the deepest, cleanest and most beautiful lakes in the Ural region – Lake Turgoyak, one large island is adjoined - the mysterious island of Faith. It is considered to be a strong and highly bio-energetic place and you can often find people with various dowsing devices, as well as artists, writers, musicians and other creative professionals who tend to draw inspiration from ancient megaliths. People continue to discover cultic constructions here, the oldest of which are archaeological monuments of the Middle Paleolithic era (which is approximately 60,000 years ago). Some famous attractions of the Island of Faith are a recluse’s cave and a mysterious unique complex of megaliths discovered by archaeologists in 2004, which were presumably built about 6,000 years ago. One of the most beautiful lakes in the southern Ural region is a Mecca for the Bashkortostan locals and Para gliders, surrounded by many legends and tales. In the 18th century this place had become famous thanks to the extraordinarily beautiful vases made of aushkul jasper, which incidentally, can be found on the grand staircase of the Hermitage. The bottom and the shores of the lake are covered with jasper pebbles, which can be easily collected as a keepsake. You can swim here, go fishing and also catch crabs. A little west of the lake there is a mountain Ausch- Tau, which has several revered Bashkir graves, including one of an Arab sheik. All of those who are buried are preachers of Islam, so both the mountain and the lake Aushkul are known even in Mecca, Saudi Arabia. Here for only 2-3 weeks a year, during the spring water flows from a saint source Aulia - this melt water can strengthen the immune system and slow down the aging process. In order to obtain this healing water thousands of people have come to this spring for many centuries. You can spend the night near the lake in a tent or you can reach the hotel in Miass or Uchaly. The Visimsky Reserve is "a treasure trove of the pristine nature of the Ural region", which is located on the western slope of the Middle Urals in the upper right-hand tributaries of the Chusovoi river. This is a region of wild, reserved, primeval forests, in which the Mansi of the Vogulsky population used to hunt. In 2001 UNESCO decided to give it the status of a Biosphere Reserve. The border between Europe and Asia is situated right in the reserve. In the buffer zone of the reserve there is a village called Big Ghalashki – it is an old Believer settlement founded sometime in the mid 17th century. This village is a great example of how quickly nature erases human footprints. Just in the 1980’s it was a big, prosperous village that existed comfortably for nearly 300 years, and today on the site of the former estates you can see numerous deer and blossoming cherry trees. The only way you know that people used to live here is because there are crosses. If you go 150 km northeast of the capital of Bashkortostan, Ufa, you will find a sanctuary – the Burning Mountain Yangantau. It is mysterious because it has nothing to do with volcanoes and is completely removed from seismic areas, but still during any given weather it erupts with hot gases and steam. Their temperature ranges from around 37 to 150 degrees Celsius. At 90 meters there is a well, which radiates heat that goes up to 380 degrees. Nobody knows how long this mountain has been burning. According to the legend, the mountain began to burn after a pine tree, which was growing on top of it, was struck by lightning. The steam contains resins, phenols, ammonia, and also possesses therapeutic properties. Here you can take special "air baths." On the banks of the river Yuryuzan near Yangantau there are springs saturated with salts and gas. The mountain and its foothills with all the sources and turquoise stretch of Yuryuzan are officially declared to be a natural monument. There is a sanatorium built nearby. The old- timers of the Prikamye region call the Chertovo settlement the ancient stone city situated on top of the Rudyanskiy ridge near the village of Usva – the most ancient settlement situated in the Perm region. This unusual and picturesque rock massif, which resembles giant tortoise shells is somewhat broken with deep cracks which are 1- 8 meters deep, just like narrow streets. This landscape monument of nature looks like it was built by an evil force – it is the object of pilgrimage for many tourists and climbers. You can spend the night here in a tent or in a recreation center in the village of Usva. How to get there: From Yekaterinburg via Perm or Gornozavodsk to Usva. After the bridge over the river Usva there is right turn going to the Jubileyniy village. After about 5 km there will be a trail to the Chertovo settlement. You will have to walk about 2 km. The distance from Yekaterinburg is 470 km, from Perm it is185 km. It is noteworthy that just 25 km from Yekaterinburg there is also a city made of stone, which bears the same name but is smaller. The Chertovo settlement located in Yekaterinburg can be found 6 km away from the village Iset and represents a mountain with a 20-meter "ridge" which includes 10 towers on its top. Some tourists tell of cases of unexplained loss of orientation in the Chertovo settlement. Ancient Voguls considered this territory to be sacred and performed various ceremonies here.